New Orleans is a unique destination that provides a vacation experience unlike any other. In 2014, more than 9.5 million visitors paid a visit to the city, affectionately referred to as The Big Easy and the Crescent City. With so many great attractions and rich history, it's easy to see why so many people decide to visit this lovely and energetic southern city. New Orleans is a vibrant southern city where you can enjoy world-class sightseeing, attractions, and - perhaps best of all - some of the best food you'll ever have the pleasure of tasting. 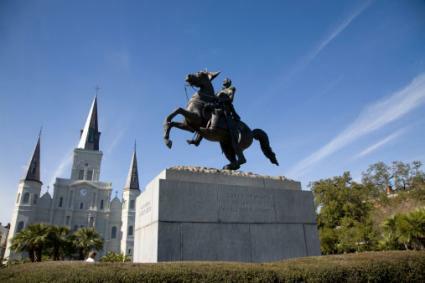 Jackson Square: Snap a souvenir shot of Andrew Jackson on horseback, visit the Cabildo museum, stroll on the Square's immaculately manicured lawns and tour the majestic and awe-inspiring St. Louis Cathedral. The stunning structure is the oldest Catholic cathedral in the United States, a national historic landmark, and the centerpiece of downtown New Orleans. Local caricature artists set up around the square will sketch your picture for a fee. 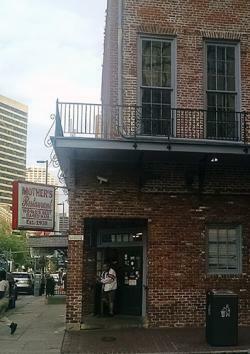 French Market: The well-known New Orleans French Market traces its roots back to colonial times. The modern French Market features both a farmer's market and flea market as well as additional opportunities for shopping, dining, special events, performances and more. 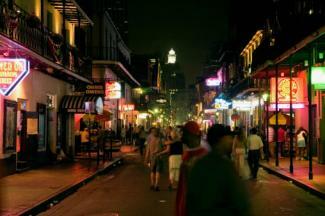 Bourbon Street: Often referred to as "the heart and soul of New Orleans," Bourbon Street is a must-see part of any New Orleans adventure. If you're a fan of nightlife, go after dark when the nightclubs are in full swing. if you prefer to see the street at its tamest (which is not very tame), go during the day. Some establishments offer adults-only entertainment, but there are plenty of options for just about anyone. You can partake of everything from beers and daiquiris to classic New Orleans experiences like a Lucky Dog (hot dog) from a street vendor or drinking a hurricane at Pat O'Brien's. Just a few blocks away, you can enjoy a gourmet meal at the Redfish Grill. There is much more to Bourbon Street than you might think. Charming shopping options: If you're a shopping fan, you'll love the array of wonderful retail options that await you in the French Quarter. Whether you like to browse through antique shops and art galleries or if you're searching for souvenirs like Pralines, t-shirts or novelty items to take home, you'll find what you're looking for on your visit. 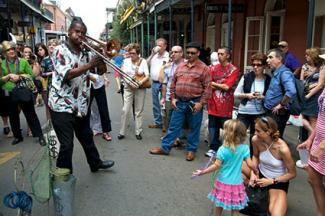 Special interest tours: There are a number of special interest French Quarter tour options. For example, if you want to get a sense of the supernatural side of New Orleans, consider booking a guided ghost, vampire or cemetery tour. If you are interested in the seedier side of the city's history, consider schedule a true crime tour. You can even see where numerous popular movies (including Interview with the Vampire) and and TV shows (including Treme) were filmed by taking a movie tour. The National WWII Museum: Located in the Central Business District (CBD), this not-to-be missed museum is ranked as the #1 thing to do in New Orleans on TripAdvisor and it holds the #2 spot on a similar list published by U.S. News & World Report Travel. Learn about World War II from world class museum exhibits and films and, if your schedule permits, participate in educational lectures and attend special events. Creole Queen paddlewheeler tour: Take a ride on the Mississippi River and view New Orleans from the water onboard the Creole Queen. Daytime sightseeing and history tours are available. If you'd rather enjoy this attraction by night, book the evening Mississippi River Jazz Cruise option that includes live entertainment and a buffet dinner. 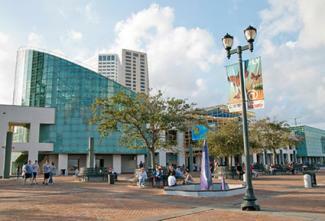 Audubon Aquarium of the Americas: Located on the edge of the French Quarter, the Aquarium of the Americas is listed as one of the best aquariums in the United States by Travel Channel and USA Today. Enjoy numerous exhibits including penguins, an Amazon Rainforest, the Gulf of Mexico and a gallery specific to the Mississippi River. There is also an IMAX theater on-site. Audubon Butterfly Garden and Insectarium: Within walking distance of the aquarium, you will find the Audubon Butterfly Garden and Insectarium. Exhibits include a hall of fame featuring the biggest insects in the world, a display highlighting local insects and, of course, a butterfly garden where you'll have an opportunity to view multitudes of butterflies in flight. Audubon Zoo: New Orleans is home to the Audubon Zoo, which has been voted as one of America's best zoos by Treakaroo. Learn about local wildlife from the Louisiana swamp exhibit, and see many other animals such as sea lions, jaguars, flamingos, primates and more. Take a ride on the swamp train for a narrated ride around the zoo. Mardi Gras World: Located on the West Bank of the Mississippi River in historic Algiers, Blaine Kern's Mardi Gras World is the studio where many of the floats featured in New Orleans Mardi Gras parades are created and stored. Taking a tour provides you with a way to get an up-close view of these marvelous creations. To get there, you can either take the Canal Street/Algiers ferry (no cars) across the river or drive across the Mississippi River Bridge . Swamp Tours: Get a sense of natural Louisiana by setting aside time for a swamp tour by boat. Several local vendors offer these kinds of tours, and most will pick you up from your hotel and drop you off in the same spot afterwards. Day and night tours are available. 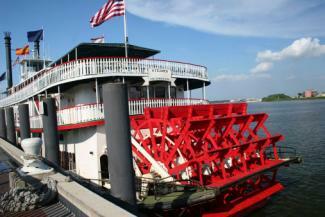 Most tours are given on flat bottom touring boats, though airboat tours are also available. 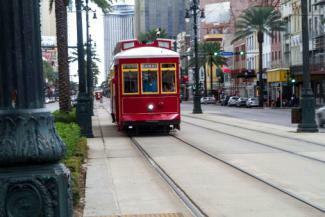 For a truly unique way to get around New Orleans while also taking in the full experience of the city, be sure to take a ride on one of the famous New Orleans Streetcars. The St. Charles streetcar line departs just outside of the French Quarter and travels through the picture-perfect Garden District, passing Tulane University, historic mansions and a number of other noteworthy sites. The Riverfront line takes you from one end of the French Quarter to the other, while the Canal Street Line provides a great way to get around the Central Business District (CBD). You can purchase a daily pass for $3, or pay a $1.25 fare for a single ride. 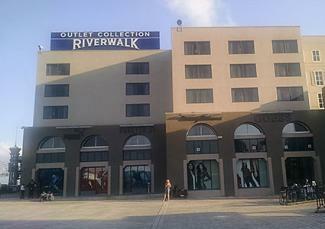 New Orleans is home to The Outlet Collection at Riverwalk, which is the only downtown-based outlet mall in the United States. Riverwalk is anchored by Nieman Marcus last call and is home to numerous other outlet stores such as Loft, Chico's, Forever 21, Skecher's Kitchen Collection and many others. You'll also find a food court and other dining options here. 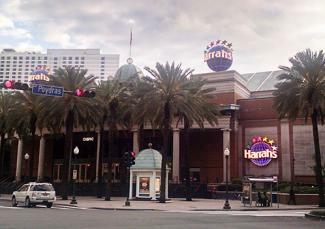 If you want to try your luck with slot machines or on the gaming tables, be sure to set aside time to visit Harrah's New Orleans Hotel & Casino. You'll feel like you've been transported to Las Vegas as soon as you step inside this full service casino that features world-class gaming, great spots for nightlife, several outstanding dining options (from the upscale Besh Steak to the Magnolia buffet), a theater and more. New Orleans is home to galleries galore, most notably, the 600 block of Julia Street, which is nicknamed, the "Soho of the South." In addition to featuring an impressive collection of architectural wonders, such as the row of 13 mid-19th century townhouses, known as the "Thirteen Sisters," the area boasts some of the Crescent City's best art galleries, from Marguerite Oestreicher Fine Arts Studio to Galerie Simonne Stern. Wondrous as they might be, the centerpiece of the art scene continues to be the Contemporary Arts Center. The massive warehouse is filled with masterpieces made by local artists. The spectacular showcases are a contemporary art lover's dream come true. Don't expect to lose weight while visiting the Crescent City. New Orleans boasts some of the most amazing eateries in all of North America. Begin your day with a beignet breakfast at the legendary Cafe du Monde. The heavenly pillows of fried dough generously doused with powdered sugar go best with a chicory-laced cafe au lait. If you're looking for a more traditional stick-to-your-ribs breakfast, you can't go wrong with Mother's Restaurant. Mother's is also open for lunch and dinner. Expect to stand in line at lunch. A mouth-watering lunch of juicy muffalettas awaits you at the Napoleon House, Central Grocery or Cafe Maspero. If you'd rather have great seafood, go to Deanie's Seafood (be sure to try the crawfish croquettes) or Acme Oyster House (where you'll stand in line but find that it's worth the extra effort). Meanwhile, dinner should be reserved for the upscale Commander's Palace. The serious splurge is worth every penny given its five-star rating and outstanding atmosphere. These are just a few of the many wonderful dining options in New Orleans. Try one of the top dining establishments as recommended by Zagat's or TripAdvisor reviewers if you want to branch out. Bad restaurants don't last long in the city, so you're sure to be delighted with any dining spot that you decide to sample. You can't visit New Orleans without getting an earful of southern comfort in the form of live Dixieland jazz music. The eastern side of the French Quarter is home to some of the most popular jazz clubs in the country. There you can sample the soulful sounds of live musicians who play their hearts out on a daily basis. Bourbon Street is also lined with street musicians who perform for free. Visit the famous 1920s-era Preservation Hall as well as Palm Court Jazz Cafe for traditional Dixieland jazz. Also check to see who might be playing at the New Orleans Saenger Theater during your visit. The aforementioned events, attractions and venues are only a small taste of what's waiting for you in New Orleans. For more information on things to see and do in the Crescent City, plus the best places to stay while visiting the Big Easy and ways to save during your stay, visit the New Orleans Convention and Visitors' website.